What did we have for Christmas dinner?! 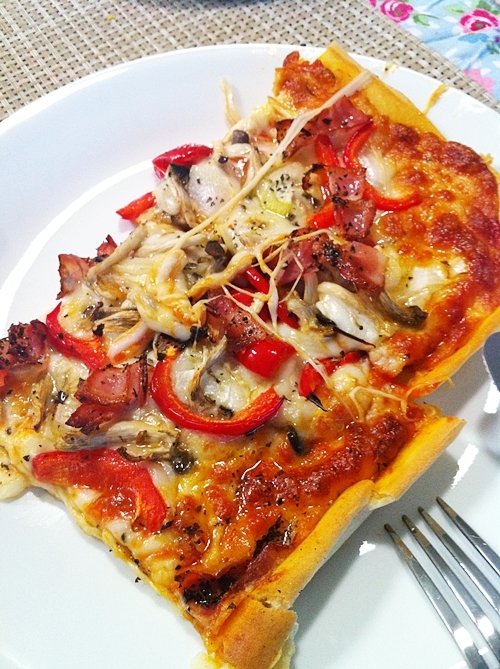 Homemade pizza~ it was an adventure! 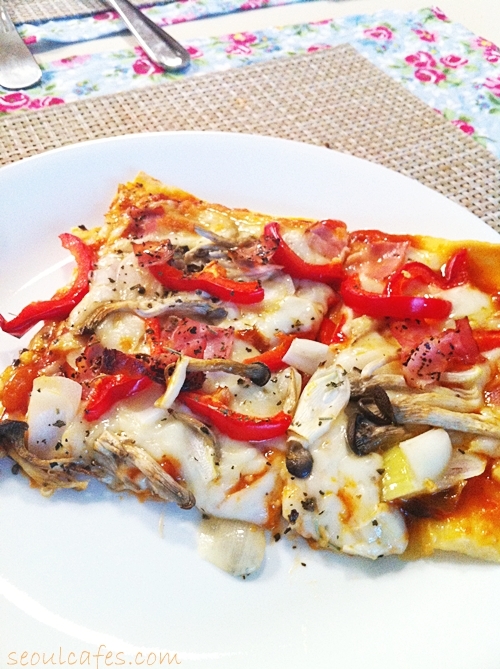 We couldn't really believe that we actually made pizza. We put recipes and instructions together by looking things up online. We weren't really sure what we were doing. But we went ahead anyway. The ingredients were pretty simple - and lucky for us that we had yeast in our pantry. Added the wet ingredients into the dry mixture. Combined it to form into a rough "dough ball". My husband did the kneading of the dough - for about 20 minutes until it was springy. We let it rise - maybe for an hour until it doubled in size. I rolled it out flat and square, so it would fit in our oven tray. We added our toppings. Our oven is of Dios (LG) and had a "pizza setting" - but the time on it was 5 hours! We didn't bother with that setting and turned on the highest heat of the oven for 230 degrees Celsius and baked for about 10~15 minutes until the crust turned brown. 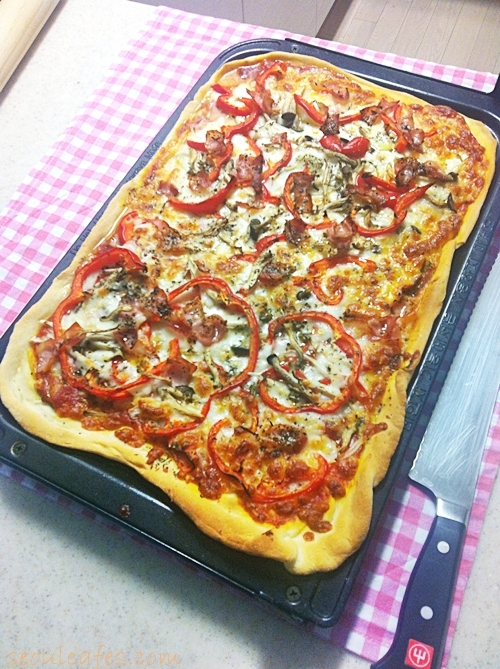 And lowered the temperature to 180 and baked for 15~ minutes until the toppings were done. Lots of peeking in the oven and opening it! The crust was perfect thickness for the temperature and our oven . We were nervous that the temperature wasn't high enough. But it all turned out well! 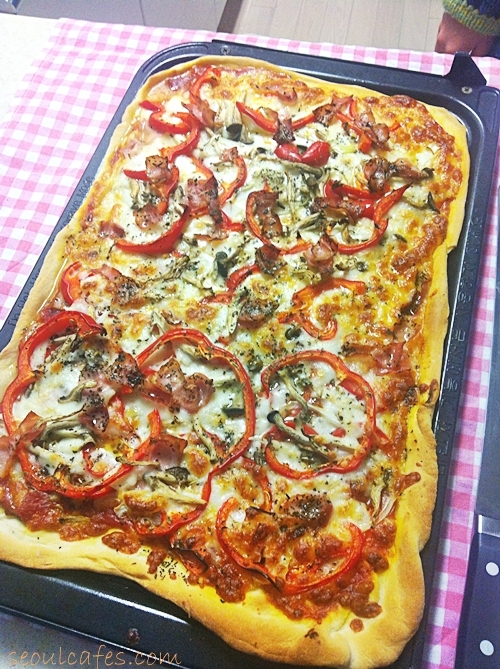 Pizza is on our dinner menu now!